1.Any State Laws violated will result in an automatic disqualification. 2. The angler with the greatest total weight is the winner. 4. Minimum sizes, crappie, Perch, and Rock Bass 7″ all other panfish 6″. 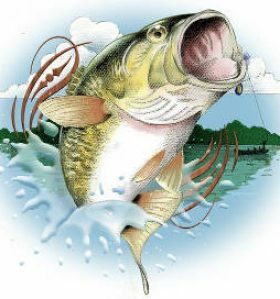 5.Bass must be (14) fourteen inches in length (or longer if law mandates). Measuring will be with the mouth closed to the end of the tail. Any fish turned in under the specified length will be removed and you will be penalized 1.00 pounds from your total weight. 6. Anglers are responsible for their fish before and after the weigh in. 7. Any live or artificial bait is allowed. 9. Life jackets must be worn during gas motor operation. 10. No drugs or alcoholic beverages are allowed during the tournament or weigh in. 11. Livewell and cooler check will be preformed prior to the tournament. 12. Must be a club member to participate. A guest must be approved by the tournament committee before the tournament. A guest is not eligible for points or money except for any side pot. 13. The check in for registration and for the weigh in will be at the public access for the lake fished unless approved by the tournament director. 14. All water connected by boatable waters are eligible to fish. 15. Participants are not allowed to be on or fish a tournament location one day before the start of any tournament. 16. Any protest against any member or boat must be made with in 15 (fifteen) minutes after the weigh in is completed. This protest will then be forwarded to the rules committee to take action on. In the event of a protest all fish will be weighed pending the review of the rules committee. 17. Any decision to cancel a tournament due to bad weather cannot be made until after a one hour grace period to see if weather improves. 18. 30% of all entry fees will be put into the club treasury. The remaining will be paid out in the following manner. The 30% will be used for purchasing plaques and awards and for the youth division. 19. The tournament championship will be calculated by using the points system that is found on each members scorecard. 30 pts to the winner, and will digress down 1 point per place. 10 points awarded to those who participate but do not turn in a catch. 20. The annual entry fee is $10 per person to join the club. Addition fees may be charged to participate in some tournaments. All youths participating in the youth league are free to join as long as a family member is a club participant.